Eight out of the 13 great whale species are still endangered or vulnerable after decades of protection. The WWF Cetaceans Action Plan aims to ensure that by 2012, a significant reduction of threats to cetacean populations that are either currently endangered, or are likely to become endangered in the foreseeable future, is achieved. WWF is working for a significant reduction of threats to endangered populations of great whales as well as several smaller cetaceans. The organization is also combating risks to whales by lobbying to bring whale hunting under the strict control of the International Whaling Commission, through field research, training and capacity building, conservation education, and by securing improved national and international action and agreements. Through support to TRAFFIC, the wildlife trade monitoring programme of WWF and IUCN, the organisation is closely investigating and monitoring the illegal trade in whale meat. There are over 80 species of cetaceans, a group made up of whales, dolphins and porpoises. Cetaceans are air-breathing, warm-blooded mammals that bear live young and nurse them on milk. They live their entire lives in the oceans and seas worldwide, inshore and pelagic. Cetaceans fall into two categories: mysticetes or baleen whales, and odontocetes, including toothed whales, oceanic and river dolphins, and porpoises. The baleen whales are named for their feeding apparatus, a series of transverse plates of comb-like baleen which descend from the roof of the mouth. Baleen is made of hard but flexible material, similar to that of human fingernails, rooted in the animal's upper jaw. The baleen act like a sieve, allowing a whale to strain food out of the water-food which includes small fish and plankton. There are 13 species of baleen whales: blue, fin, sei, Bryde's, humpback, northern minke, southern minke, North Atlantic right, North Pacific right, southern right, pygmy right, bowhead, and gray. They range in size from the compact minke whale, whose average length is around 8 metres, to the gargantuan blue whale, which can reach lengths of over 33 metres and weigh up to 120 tonnes - as much as 32 elephants. The only great whale with teeth is the sperm whale. Toothed whales, dolphins and porpoises, are a diverse group of over 70 species. They range in size from the Hector's dolphin and vaquita, both roughly 1.5 metres long when fully grown, to the mammoth 18 metre male sperm whale. Some other examples are the two species of pilot whale, beluga whale, narwhal, finless porpoise, and the rather large family of beaked whales. Baleen makes up baleen plates, which are arranged in two parallel rows that look like combs of thick hair; they are attached to the upper jaws of baleen whales. 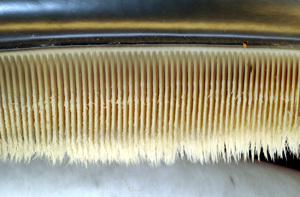 Whales use these combs for filter feeding. The sei whale has beleen plates as shown above. Watch video of sei whale feeding on a large school of fish. Nearctic, Palearctic, Afrotropical, Indomalayan, Australasian, Oceania.